Thrilled physicists and astronomers announced Monday the first-ever observation of the merger of two neutron stars, one of the most spectacularly violent phenomena in the Universe. We asked Patrick Sutton, head of Cardiff University's gravitational physics department, who contributed to the discovery. Q: What are neutron stars? A: You can think of them as the collapsed, burnt-out cores of dead stars. When large stars reach the end of their lives, their core will collapse, the outer layers of the star blown off. You're left with an extremely exotic object, this neutron star. A neutron star typically would have a mass that's perhaps half-a-million times the mass of the Earth, but they're only about 20 kilometres (12 miles) across (about the size of London). They are very hot, perhaps a million degrees, they are highly radioactive, they have incredibly intense magnetic fields... They are arguably the most hostile environments in the Universe today. 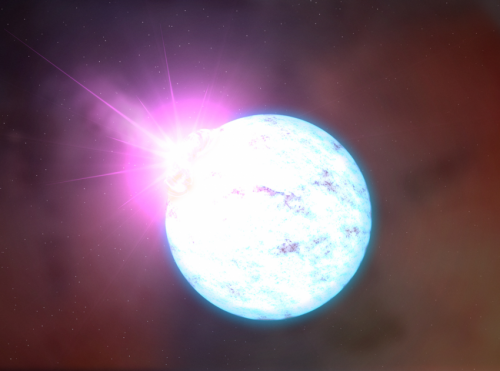 Q: Why do neutron stars merge? A: It's very common for stars... in the Universe to actually be formed in pairs by a given gas cloud. If the stars are large enough, then at the end of their life they explode and they leave behind neutron star cores, and the neutron stars will continue orbiting each other. As they orbit, they give off gravitational waves and the waves carry away energy and so the stars slowly fall closer and closer together. As they get closer together they orbit faster and faster and the gravitational wave emission speeds up. You get a runaway process where the two stars in the last few moments of their life, they'll be orbiting each other several hundred times per second, so moving at very close to the speed of light, and eventually they will merge. A: Because we don't understand exactly the mechanics of how these neutron stars work on the interior, it's not certain what the final fate is. If the stars are heavy enough, we're sure they will collapse to form a black hole and some of the remaining matter... will form what is called an accretion disk orbiting just around the black hole. It may be that if the stars are light enough, that they will actually form a single, very heavy neutron star instead of a black hole. That may be stable and stay as a neutron star forever, or it may be unstable and eventually collapse into a black hole.